Colleen here with a card that we should all have in our card stash. This was so much fun to make and it just made me smile the whole time I was making it. This is the Whispers Die by Die Versions and makes it so easy to make. 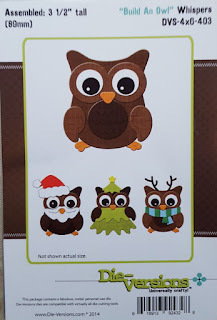 There are actually four different owls you can make with this one die and when you use your imagination there could be even more. I also used the Words Set 1 by Karen Burniston die for the greeting on the card. This die comes with 6 different dies. You could really dress up these owls any way that you want for any occasion. Great card. This is so cute!! Those little owls are just darling!!! OMG so cute! This trio certainly made me smile this morning! Thanks!! adorable owls! I love owls! Your reindeer owls are too cute and fun. Great card! Love it!